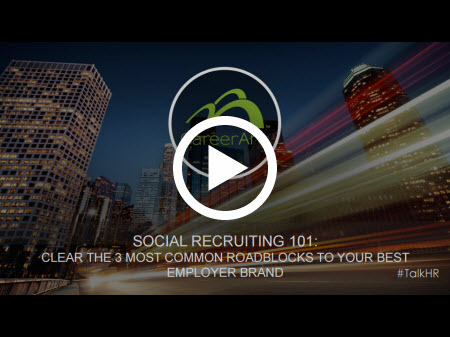 Listen to industry experts and thought leaders discuss the importance of employer branding and social recruiting. Join Erin Mathew -- top talent sourcer, blogger, and speaker -- and discover highly engaged talent communities on Reddit and learn how to recruit top candidates. This webinar is approved for HRCI and SHRM certification. Join Jon Thurmond -- Mid-Atlantic Regional Human Resources Manager for Team Fishel and #HRSocialHour Podcast Host -- and discover how to find, build, and nurture communities on social media. This webinar is approved for HRCI and SHRM certification. 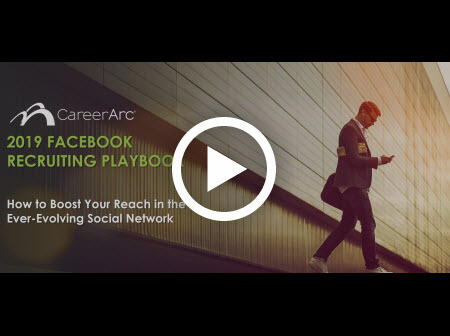 Join Mira Greenland -- SVP of CareerArc -- and discover new Facebook best practices to maintain an engaged candidate audience, achieve maximum exposure, and more. This webinar is approved for HRCI and SHRM certification. Talent is Evolving, Are You? How to Adopt a Retention Mindset, Abandon Transactional Approaches, and more! Join Steve Browne -- VP of HR for LaRosa’s, Inc., -- and learn how to become a talent-based organization in today's evolving labor market. This webinar is approved for HRCI and SHRM certification. Join Daniel Roberts -- CEO of Friendly Human -- and learn how to identify more culture-fit talent and usher top candidates from attraction to hire in less time. This webinar is approved for HRCI and SHRM certification. Join Todd David -- Senior Sourcer -- and Austin Luu -- Global Talent Sourcer -- and discover surprising new talent sources and gather techniques that get you the information you really need, faster. This webinar is approved for HRCI and SHRM certification. Join Todd David -- Senior Sourcer -- and discover surprising new talent sources and gather techniques that get you the information you really need, faster. This webinar is approved for HRCI and SHRM certification. 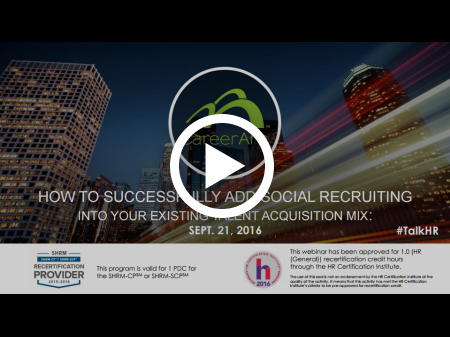 Join Greg Hawkes -- Strategic Talent Sourcer -- and discover high-impact techniques, tools, and hacks necessary to succeed in today’s challenging talent market. This webinar is approved for HRCI and SHRM certification. Talent Acquisition + Marketing: Let's (finally) Be Friends! Join talent branding expert, Lisa Chartier -- and learn how to cultivate an effective partnership with your marketing team to succeed as a business and employer. This webinar is approved for HRCI and SHRM certification. 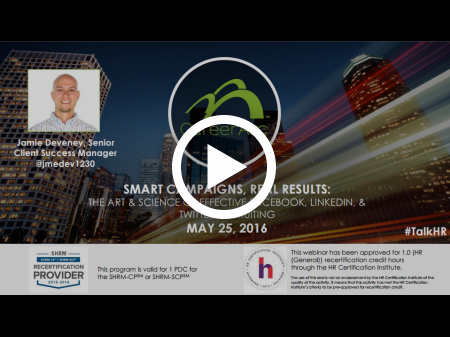 Join Brian Smith -- Senior Associate at Mercer -- and learn how to create memorable and meaningful candidate experiences that will impact your talent pipeline. This webinar is approved for HRCI and SHRM certification. Join James Ellis -- Global Head of Employer Brand at Groupon -- and discover the new rules of recruiting that will secure the best talent for today and tomorrow. This webinar is approved for HRCI and SHRM certification. 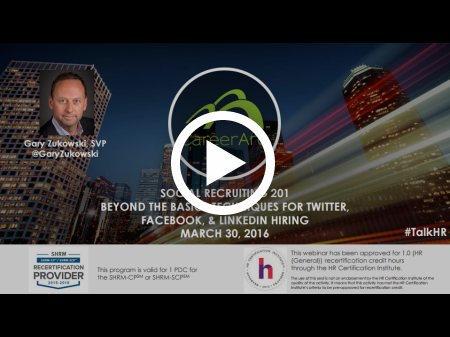 Join Jon Thurmond -- Mid-Atlantic Regional Human Resources Manager for Team Fishel -- and discover the must-know tactics and strategies to recruit on LinkedIn, Facebook, and Twitter. This webinar is approved for HRCI and SHRM certification. Join Jennifer Newbill, Director of Global Talent Acquisition COE (Center of Excellence) and Amy Forbes Winebright, Global Employment Brand Project Manager at Dell -- to find out what are the 2018 must-have tools for recruiting teams of any size to compete for top talent. This webinar is approved for HRCI and SHRM certification. 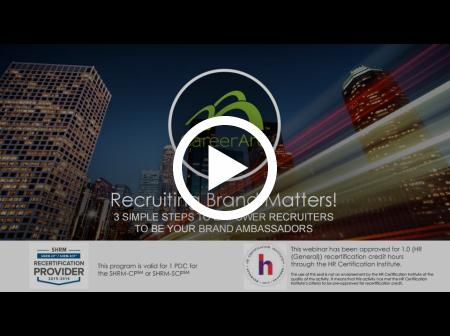 Join Charlotte Marshall--VP of Digital, Social Media & Employer Brand at Magellan Health--and discover the trick to creating an employer brand that resonates with candidates, internal stakeholders and customers. This webinar is approved for HRCI and SHRM certification. Join Kerry Noone--Recruitment Marketing and Advertising Director at CVS--as she reveals what, and what not to do, so you can confidently recruit with purpose and authenticity on social media. This webinar is approved for HRCI and SHRM certification. Watch this unique workshop led by Rayanne Thorn - VP of Marketing at Dovetail Software - whose years of diverse experience spans recruitment, employer branding, employee retention and marketing. This webinar is approved for HRCI and SHRM certification. James Ellis, Head of Global Employer Brand at Groupon, returns to cover all the effective ways of crafting and communicating a unique employment brand message. This webinar is approved for HRCI and SHRM certification. 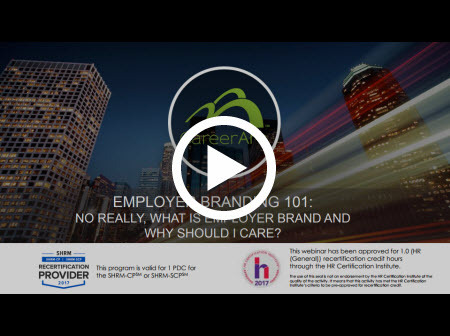 Employer Branding 101: No Really, What Is Employer Brand and Why Should I Care? Join James Ellis, Head of Global Employer Brand at Groupon, who will define what an employer brand actually is (and isn't) and how to start communicating your employer brand to the world. This webinar is approved for HRCI and SHRM certification. Join Audra Knight, Recruitment Marketing Strategist at Tenable, and learn how to apply an effective inbound marketing strategy on social media, email, website, and other channels to showcase your employer brand and open jobs. This webinar is approved for HRCI and SHRM certification. 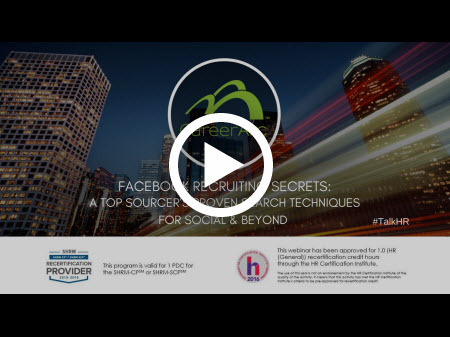 Join Todd Davis (The Candidate Generator), Senior Sourcer (Google, Amazon) who will reveal the proven approach, tools, and techniques to simply and effectively source talent on Facebook. This webinar is approved for HRCI and SHRM certification. Greg Hawkes—Sr. Recruiter & Talent Sourcer in the Texas Medical Center and a leader in sourcing and healthcare recruiting—reveals the high-impact techniques, tools, and hacks necessary to succeed in today’s most challenging talent market. This webinar is approved for HRCI and SHRM certification. Ben Gledhill, head of Employer Branding & Candidate Experience at Manchester Metropolitan University, reveals how budgetary boundaries can bring about creative solutions, and how to set realistic goals that stretch—but never break—your limits. This webinar is approved for HRCI and SHRM certification. Lisa Chartier, Global Head of Employer Brand & Recruitment Marketing at Philips, shares a 5 step blueprint to start an effective candidate experience strategy and insights about what macro trends are influencing companies’ ability to deliver positive candidate experiences in today’s digital world. David Nicola, Technical Sourcer at ViaSat Inc., who will reveal the proven tech and tactics he uses for finding the most in-demand talent. 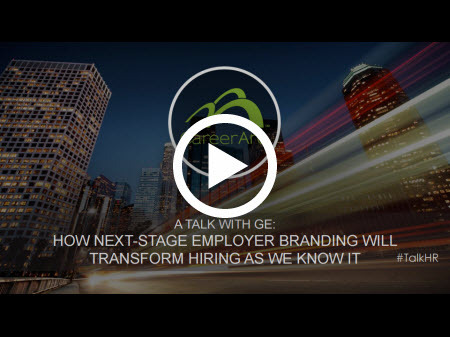 Shaunda Zilich, Global Employment Brand Leader at GE, discusses where recruiting and employer branding are headed, why marketing is paving the way, and what HR professionals must. Lindsay Parks, TA Social Media Specialist at Travelers, reveals coveted tricks of the trade that sharpen your social media skills and push your recruiting efforts to their peak. CareerArc Client Success Manager, Alyssa Gioscia, reveals how to lead your branding efforts in the new year and navigate roadblocks. 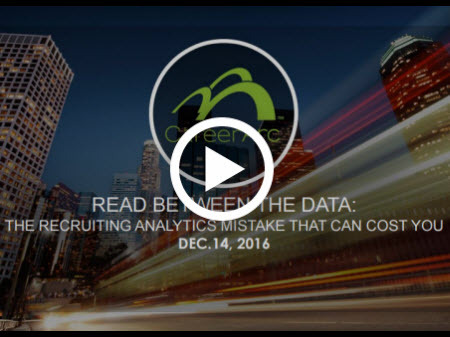 Christy Childers, Global Employer Brand Manager at Dropbox, reveals the keys to contextual data analytics for recruitment. Katie Gechijian—Lead Consultant at Proactive Talent Strategies-navigates Facebook, Chrome, and other tools and techniques that help target and engage the best talent on the largest social network. 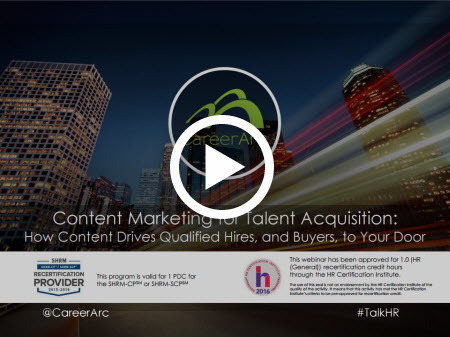 Carmen Fontana, National Talent Acquisition Manager, and Misty Walsh, National Marketing Lead, at Centric Consulting share how their bootstrapped content marketing initiatives drove exponential returns. Irma Long, VP of Talent at Follett Corporation shares how to craft a Social Recruiting Roadmap that complements a larger talent acquisition strategy. Top sourcer and Wells Fargo VP Katie Gechijian reveals tested tricks of the trade that can transform your social sourcing strategy. Dr. Anna Tavis, Sr. Editor of HR People & Strategy, delivers a captivating lecture explaining why the death of Talent Management as we know it is giving swift rise to the age of Employee Experience. Ericsson’s VP of HR, Gunjan Aggarwal, and Sr. Director of Global Employer Brand, Lisa Smith-Strother, share their strategies to build a diverse workforce. Jamie Deveney, CareerArc Sr. Client Success Manager reveals the best techniques to ensure you reach the right audience with your Twitter, Facebook, and LinkedIn campaigns. CareerArc VP Mira Greenland and SVP Gary Zukowski share recruiter enablement plans and steps to empower your recruiters. 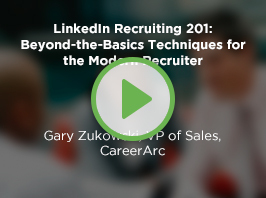 Gary Zukowski, SVP of CareerArc, reveals coveted tricks of the trade that push social recruiting efforts, and their success, to their peak. Jennifer Newbill, Dell Inc.'s Sr. 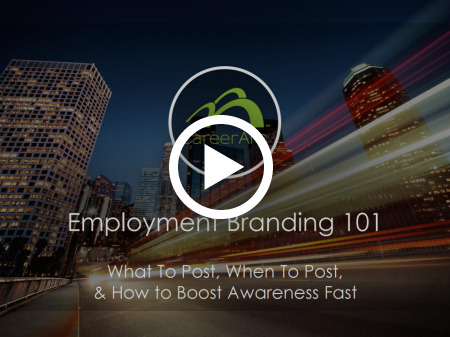 Manager Global Candidate Attraction, Engagement and Experience, and CareerArc's Mira Greenland reveal the formula to eye-catching social media posts that showcase your unique employer brand. Discover how the best employer brands are using social networks to engage and build their online talent community. 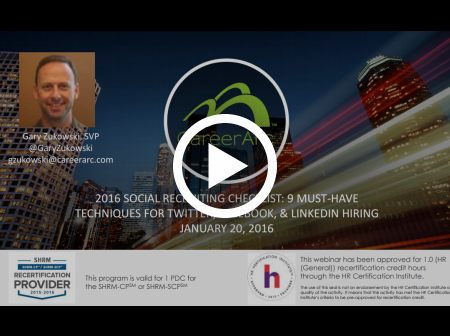 SVP of CareerArc, Gary Zukowski, shares how to plan and execute the latest and greatest techniques in social recruiting. 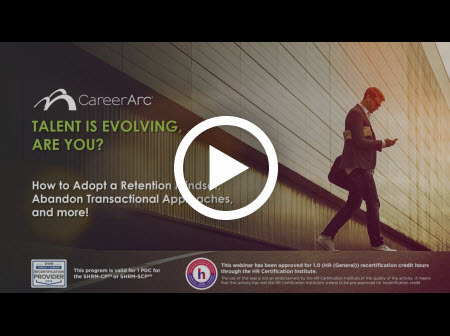 Employer branding expert, Eric T. Tung, and CareerArc Client Success Manager, Audra Knight, share ways to dress your personal brand and your employment brand for success in 2016. Else Ross, Employee Experience Specialist at Forrester Research, and industry veteran Mira Greenland, VP of CareerArc, discuss the best practices in building a rich talent community through social media. 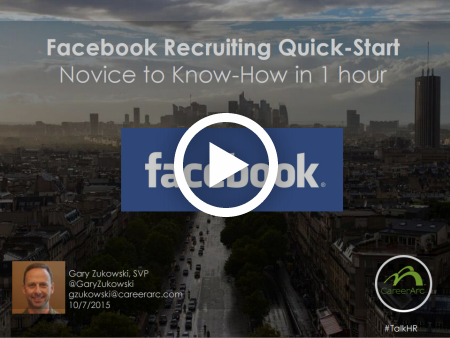 SVP of CareerArc Gary Zukowski shares Facebook tactics you can use immediately to tap into Facebook’s vast talent pool. Celinda Appleby, Head of Global Recruitment Branding at Oracle, reveals which types of posts are most shared, when posts are most viewed, and what really grabs candidates’ attention. 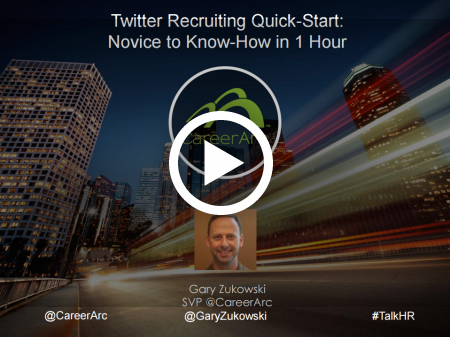 If you’re new to Twitter and want to advance your Twitter proficiency, fast, then join SVP of CareerArc, Gary Zukowski, in this accelerated course. 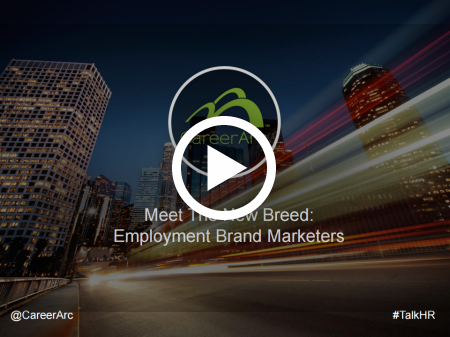 Industry veteran Mira Greenland, VP of CareerArc, and Celinda Appleby, Head of Global Recruitment Branding of Oracle lead a discussion on the profile of a successful Employment Brand & Social Media Marketer. Gary Zukowski, SVP of CareerArc, and Audra Knight, CareerArc Integration Specialist & Certified LinkedIn Professional Recruiter, reveal the many ways to advance your employer brand and supercharge your sourcing strategy on LinkedIn. 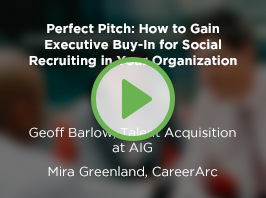 Guest speaker Geoff Barlow, Talent Acquisition at AIG, and industry veteran Mira Greenland, discuss how to effectively pitch social recruiting to your executive board and stakeholders. Join Lindsay Jurisch, Director of Global Talent Acquisition at Sutherland Global Services, and industry veteran, Mira Greenland, discuss the best way to measure the full impact of your social recruiting efforts. Gary Zukowski, SVP of CareerArc, discusses how to best navigate Facebook for recruiting and implement a strategy that can adapt to the ever-changing Facebook environment. Jim Citrin, best-selling author and industry leader in executive recruiting, as he explains how to identify exceptional talent and how to attract the brightest aspiring professionals to your organization. Kerry Noone, Employer Branding and Digital Marketing Manager at Amtrak, and Mira Greenland, VP of Sales CareerArc, discuss the secrets to managing an effective social recruiting program with a less-is-more approach. Graduate to the next level in Twitter Recruiting. Join SVP of CareerArc, Gary Zukowski, as he teaches top Twitter tactics used by the most effective social recruiters. Are Social Recruiters the Ultimate HR-Marketer Hybrid? Rayanne Thorn, Chief Strategy Officer at TalentBrowser, and industry veteran Mira Greenland, discuss how social recruiting skills are teaching you how to be tomorrow’s HR leader. Industry thought leader Carrie Corbin, formerly of AT&T and Samsung, and Mira Greenland of CareerArc discuss how to ignite an employee advocacy program that works and lasts. Elizabeth Jacoby, Recruiting Manager at Bar Louie, and industry veteran Mira Greenland discuss the social recruiting strategies and tactics you will need to face today’s tough hiring climate.